More than 3,000 people have applied for seats at Tony Blair's appearance before the Iraq Inquiry. The inquiry, which has 60 seats, will hear from the former prime minister on 29 January for two three-hour sessions. Seats have been allocated for one session only, with a third reserved for relatives of those killed in Iraq. Over the full day 80 places will be provided for the general public and 40 for families. An extra 700 seats are being allocated in a separate room. 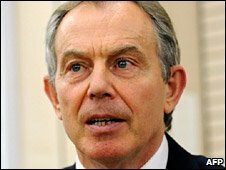 Mr Blair, prime minister during the Iraq war in 2003, is expected to answer questions about the build-up to war and planning for its aftermath. He will be the highest-profile figure to appear before the inquiry, which has already heard from his former communications chief Alastair Campbell, chief of staff Jonathan Powell and former Defence Secretary Geoff Hoon. The level of interest in Mr Blair's appearance prompted the inquiry to hold a ballot - overseen by Northern Ireland judicial appointments ombudsman Karamjit Singh - to allocate seats fairly. The inquiry confirmed on Tuesday that 3,041 "valid entries" had been received and those who had won places would hear from them in the next few days. A separate ballot was held for the relatives of those killed - 28 families applied for up to two tickets each, six families were unsuccessful but will be allocated a seat in a private viewing room if they wish. The huge interest in Mr Blair's appearance means an extra viewing room has been set up for 700 people in the large auditorium at the Queen Elizabeth II conference centre, where the inquiry is taking place. Those seats were also allocated through the ballot and will again be split into the morning and afternoon sessions - so overall will provide 1,400 places. Inquiry Chairman Sir John Chilcot said the number of people applying for seats confirmed the panel's view that "the best way to fairly apportion the seats in the hearing room was through a ballot".